These maps are from page 144-145 of Historical Atlas of the Holocaust , copyright 1996 by Yechiam Halevy, Macmillan Publishing USA, Simon & Schuster Macmillan, New York. I'm going to combine this letter because I want to tell you in some detail of something I have just seen--the site of one of the world's greatest horrors, I think. Perhaps Dachau, just the word, means something to you. Here was one of the Nazis' most horrible concentration camps--and we are staying within its barbed-wire enclosure in the hospital building. 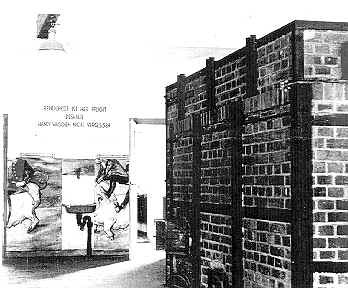 Across a high concrete wall, just a few yards from me now, are the buildings where many thousands of starved and diseased persons finally were put to death, by one of several devices the ingenious Germans had arranged. The first sight one sees is the row of small concrete gas chambers. 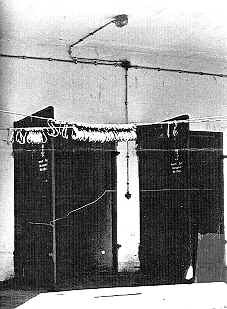 These small rooms, about six feet square--could either be used for decontaminating clothes--and bodies--or put prisoners to death. The next room, large and with a low ceiling first gives the impression of a huge shower room. There are drains in the floor and shower spigots in the ceiling--but all fakes. Prisoner were made to take off all their clothes and enter the room, believing they were to take a bath. As many as 300 persons, I suppose men and women all in one group, were crowded into this room, the door sealed, and the gas turned on. In seven or eight minutes it was all over. The next room was about the worst, I believe. Here were four, large, furnaces, the crematorium. 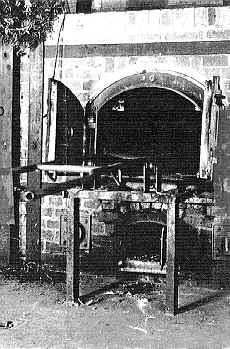 As many as three bodies were crammed into each furnace at a time and burned, about 165 a day, we were told. 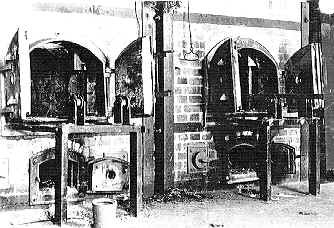 Some of the victims were hanged on the rafters just a few feet from the furnaces, then burned. But deaths too greatly out-numbered the furnace capacity so bodies were piled like sacks of flour in the next room, hundreds of them. In the basement of this building was a bone crusher where the remains from the furnaces were ground into small particles, either for fertilizer or to be put into small urns, resembling flower pots, on the pretense of being sent to relatives. 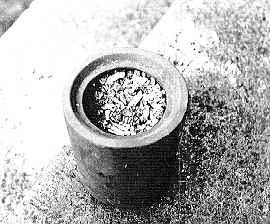 The basement is full of these pots and bone ashes litter the floor. Even in death these poor creatures were shown no decency. 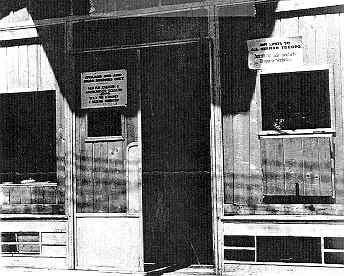 Outside are more example of Nazi technique--a long mound of earth before which many a prisoner knelt and was shot through the head, a tree with rope marks on one limb where "special" prisoners were hanged, rows of kennels where half-starved dogs were kept to be turned loose on the inmates if things became too dull. Behind another enclosure of close-stranded, electrically charged barbed wire, all of it surrounded by a moat and heavily guarded, the prisoners were quartered. When the Americans broke into the camp, they found hundreds of people too weak from starvation, dysentery and typhus to walk from their huts. Many died before they could be moved. The shacks were finally cleared and burned to the ground by the Yanks. 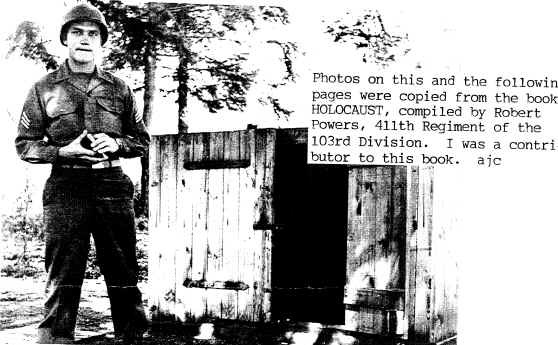 I might add that several thousand SS troopers, many of them responsible for the operation of the camp, are now on the inside looking out--behind electric wire, floodlights, moat and machine guns. They are forced to do KP, clean up the mess they helped make--but they still live a hundred times better than their prisoners did. Enough about the camp; now something about what I am doing here. Last Friday about 900 men from 409 were sent here, the 47th Regiment of the 9th Division. The rumor came yesterday that it was all a mistake, that we were supposed to have gone to the 90th Div. or to replacement depots. But today the regimental commander welcomed us to the 47th as if we were going to stay. So we are still not sure of our circumstances. We have not yet been assigned to companies or battalions. We're waiting for that now. Dachau is also on the outskirts of Munich, though we had to do a lot of traveling around to get here. Well, enough for this time. I'll still use my old address. The experience of Dachau was one of the places that is burned in my mind 'til I die. A lot of the "kids" claim it never happened but we know, don't we? When we went through there we were to wipe out snipers and the war was still on. U.S. Army Sergeant Guide explaining wood box used to cram people in (tightly) as punishment. 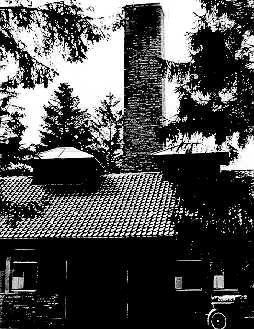 Gas Chamber - Note: Sign on Crematorium & Chimney Door: Caution Gas! Life Threatening Do Not Open! One of the Entrances to Crematorium Area. Note "Sign" and Murals below Crematorium Oven on right - Translated as: "Cleaniness here is a Duty. Don't forget to wash your hands." This page maintained by Bruce Clayton. Copyright © 2008 by Bruce D. Clayton, All rights reserved.